Eyenuk has a proven track record of pioneering US NIH SBIR/STTR grant funded research in collaboration with academic and industry partners. Recent funded projects include: EyeArt (EB013585, EY026864, EY027241), EyeMark (TR000377), EyeSeeAMD (EY025984), EyeApp (EY024848), and EyeReadUWF (EY028081). 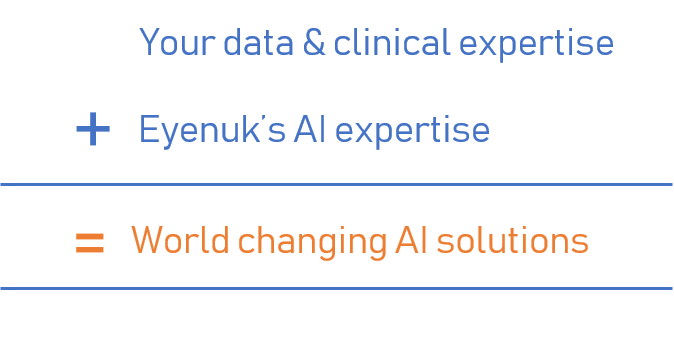 If you are a healthcare or academic researcher/ institute with ophthalmic or chronic disease data and are interested in collaborating with Eyenuk on the development of novel AI solutions, please contact us using the form below.